Surrey captain Gareth Batty says it feels "like Christmas Day" with Kevin Pietersen and Kumar Sangakkara set to play in the County Championship. Batsman Pietersen is back at The Oval as he bids to return to the England set-up while Sri Lanka star Sangakkara has joined on a two-year deal. "There aren't too many players who can class themselves as greats of the game," Batty, 37, told BBC London. "We have two this year in Kumar and Kevin. It is a coup for the club." "People have said before that English cricket needs a strong Surrey and I agree with that. The way they are going at the moment they look like they are going to get themselves back to being a top side. "They are developing some fantastic players and have a great coach there in Graham Ford. "If you have a lot of young players, someone like Sangakkara is going to be a phenomenal signing. If you can drop a world-class player into a group like that, there should only be positive effects." Left-handed wicketkeeper-batsman Sangakkara is currently top of the International Cricket Council Test batting rankings and second in the ODI standings, having retired from ODI cricket at the end of the World Cup. The 37-year-old become the first player to score four consecutive hundreds in the 50-over game at the World Cup. Pietersen, discarded by England after the Ashes whitewash in Australia in early 2014, has returned to county cricket in a bid to force his way back into the national side - and scored 170 on his return for Surrey against Oxford MCCU. Pietersen posted this picture of himself and Kumar Sangakkara on Twitter on Thursday, tweeting "This bloke can bat!" Surrey director of cricket Alec Stewart and Batty believe the duo will provide inspiration for the rest of the squad as Surrey eye promotion from Division Two. "Kumar is the number one player in the world and to have someone of his stature is great," Stewart said. "Kevin is another great asset but what is important is we don't just rely on two people or so. There is a talented dressing room and young players developing nicely. "Our players will learn so much from them and that will continue." Batty added: "Ultimately whether they are on the team sheet or not, it is down to the other guys to not be distracted by it and rise up to their levels." "It will be fascinating to see how Surrey progress, with promotion the aim in the Championship. There will be real competition for places in the top seven. 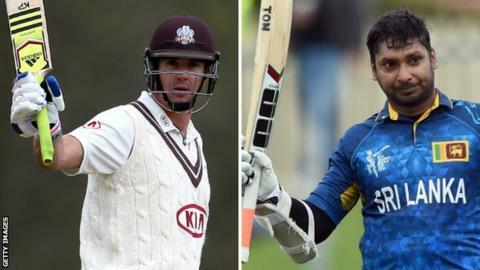 Kumar Sangakkara and Kevin Pietersen - two world-class batsmen - are creating a real buzz for the summer." Read the BBC's club-by-club guide ahead of the start of Surrey's campaign. Batty wants Surrey, who finished fifth in the second division table in 2014, to fulfil their potential this season. "We are a club with huge history and we have a lot of talent in the changing room," the spinner said. "Talent counts for nothing - it is about wins and points. Hopefully by the end of the year, if we keep striving hard, we will be where we want to be. "If we get to near the end of the season and there are chances for winning promotion, the league or cups then we are doing something right." Surrey begin their Division Two campaign against Glamorgan in Cardiff on Sunday.